Entrepreneurship Each employee should show initiative and be motivated by a desire to win, to commit and to succeed. Responsibility Each individual is fully accountable for his or her decisions and actions. Trust Relations within the Group are based on trust, which is the cornerstone of autonomy, frankness and authenticity. It is for each person to establish and develop his or her trustworthiness. Respect Respect is the basic rule of behavior that guides every employee in all his or her actions: respect for oneself and respect for other employees, customers, third parties, the trade unions, society at large, the Group’s principles, laws and regulations, the environment, fairness and ethics in the broadest sense. Setting an example Each day, every employee is expected to give the best of themselves, to strive constantly for quality and to demonstrate the highest level of professionalism. Humility Through continual self-questioning and by maintaining a humble attitude, each employee is always able to advance. For many years, compliance with business ethics and standards of integrity has been an intangible management principle throughout the Group. Sincere and open competition gives Colas Canada companies the best possible conditions in which to develop value for the company’s organization, techniques and expertise, and to foster long-term partnerships with its customers. In the area of transparency and business ethics, many practical initiatives have been undertaken, both in-house and with partners. 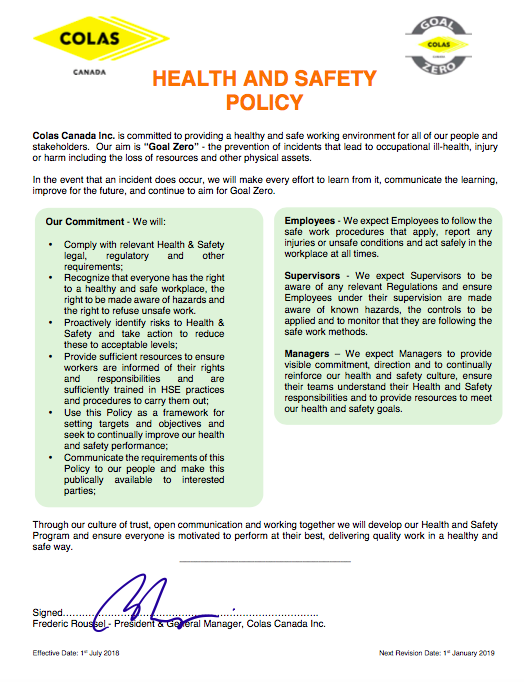 Safety is a top priority in all of the Colas Canada companies and our target always remains the same, zero accidents. Subsidiaries are constantly researching and testing new approaches to workplace and transportation safety and modifying their accident prevention systems using risk evaluation, action plans, safety audits, toolbox safety talks on worksites, accident root-cause analysis, inter-company safety competitions, coordination of communication and management tools, safety induction for recently hired personnel, training courses dedicated to accident prevention, training days and awareness raising for road accident prevention. Safety is, and always will be, one of the most important aspects of the Colas Canada culture. Please discover the Colas Canada Health and Safety Policy. The Colas group launched in 2013, a safety campaign: ''Safety Attitude'' for paving the way to a durable safety culture throughout the Group and amongst all employees. 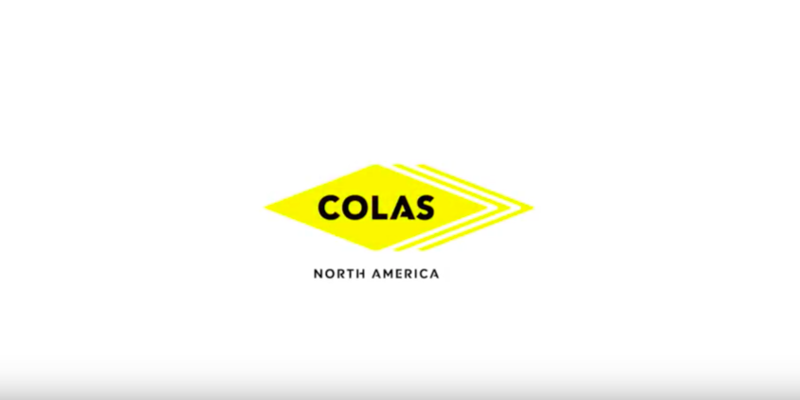 At Colas Canada, Responsible Development is built on a long term vision with continuous improvement practices to meet the growing demands of road infrastructure users and customers. Thus, through improvement, the company takes into consideration environmental, social and economic aspects in its decision-making. Colas Canada and its subsidiaries are established and perform work in the ancestral territories of the native communities. We commit ourselves with the First Nations through long-lasting partnerships. The great disparity in the development of road infrastructures currently experienced by the native communities affects many aspects of their members’ everyday life. To address these challenges, the Colas Canada group is involved through recruitment, training, cultural exchange and creation of partnerships and joint ventures in the communities, for the development of road infrastructures and engineering works. ENVIRONMENT. Due diligent, Colas Canada takes its responsibilities and performs annual self-evaluation through tools derived from environmental certifications such as ISO 14001 and NAPA DIAMOND. In addition, Colas Canada takes steps to conserve and promote biodiversity with an educational approach. SOCIAL. Leader in the field of road construction, Colas Canada maintains an open and transparent dialogue with local communities. Also, reducing risks of users and employees regarding health and safety is always a priority. ECONOMIC. Recycling, energy management and technological innovations allow the company to reduce its impact on natural resources and assure continuity with the following generations. whose vision is a transformed built environment leading to a sustainable future. The Group's Responsible Development Logo is «Athena's Owl», the Greek symbol of wisdom.